For me, herringbone stitch is one of those bead weaving stitches where I'm not afraid to experiment and discover all it has to offer. Maybe it's the history and culture behind herringbone stitch with its origins in South Africa that speaks to me. Whatever it is, I love the look and feel of herringbone stitch in all of its many forms and variations, and I love how versatile it is. I think I really got hooked on herringbone stitch after I purchased a kit from Leslie Frazier at Bead Fest Philadelphia back in 2009. She had a selection of her gorgeous Autumn Dreams necklace kits for sale, and I was totally in love with the earthy brown and green colors. I was also intrigued to learn how she made those oak leaves with flat herringbone stitch! In my previous Make Waves with Herringbone Stitch blog, I showed you how to achieve gentle curves on the outside of flat herringbone stitch. This tutorial will show you how to make undulating curves within a piece of flat herringbone stitch, and it really is a lot easier than you would think. 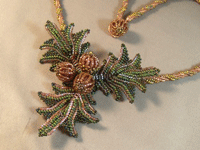 For this particular technique, it works best if you use two sizes of seed beads. I used a Japanese 11o and 15o in two contrasting colors. Make a ladder of seed beads using the 11o beads that is four beads long. Do not go back and reinforce the ladder. Work one row of flat herringbone stitch, making your desired turn at the end. I prefer to make a brick stitch-style turn by catching the thread loop between the beads and coming up through the second bead added. 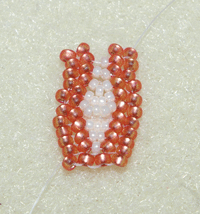 Add one pair of 11o seed beads. Pick up one 15o bead and then pass up through the next 11o seed bead. 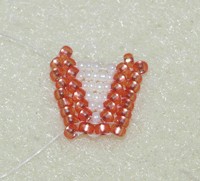 Add a pair of 11o seed beads and turn. As you work, increase the number of 15o seed beads that you add between pairs of 11o seed beads by one. So in the next row, you'll pick up two 15o seed beads. 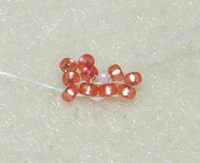 Work until you have a total of five size 15o seed beads between your pairs of 11o seed beads on either side. Then begin to decrease the number of size 15o seed beads between your pairs of 11o seed beads until you are back down to one. 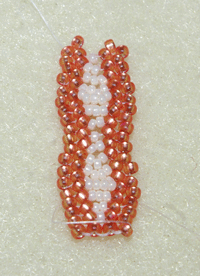 As you work you'll notice that your beadwork will get wider and narrower as you add and subtract beads. As you add beads to the center, keep your tension relatively loose to make sure you have enough room for the beads to expand. 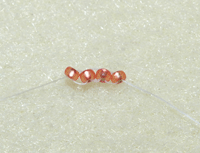 As you subtract beads from the center, keep your work a little tighter for a smoother look. This type of undulating flat herringbone stitch makes beautiful bracelets and necklace straps for large pendants. It also makes fun anklets and handbag straps, too. Experiment with different beads in the center and on the edges, mix up your colors, and most of all, have fun. Don't be afraid to make mistakes when you're experimenting with herringbone stitch – you m might end up with a beautiful "mistake"!